Gamblit Gaming unveiled TriStation, a pod containing three interactive gaming stations, at Planet Hollywood on Monday. Six skill-based games, including “Into the Dead,” are available on each TriStation. Tuesday, Oct. 24, 2017 | 2 a.m. 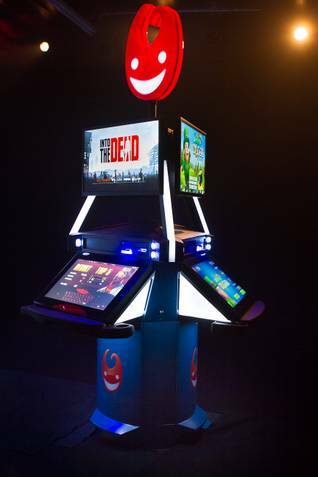 The second round of skill-based gaming machines has hit the Las Vegas Strip, allowing players to stake their cash on their abilities to use a cartoon catapult or survive a zombie-infested cornfield. Gamblit Gaming unveiled TriStation, a pod containing three interactive gaming stations, at Planet Hollywood on Monday. There are six skill-based games available on each TriStation for players who want to risk money on something a little less random than slot machines. “Into the Dead.” A zombie shooter game that was originally a smartphone game with 72 million downloads. “Catapult King.” Also first a smartphone game, players use a catapult to topple knights and castles. “Lucky Words.” Players must quickly put together letters to form words. “Match 3volution.” Players create creatures and match them. “Smoothie Blast.” Players swipe fruit to make smoothies. “Slice of Cake.” Players slice ingredients to bake a cake. The TriStation is in the midst of the Nevada Gaming Control Board’s New Innovation Beta process, adopted by the board (in response to state legislation) to accelerate the development of new games. Gamblit introduced another machine, the Model G, in Caesars Entertainment’s resorts and other Strip casinos earlier this year. The Model G comes in two game variants, “Gamblit Poker” and “Cannon Beard’s Treasure,” both of which have already received regulatory approval. Gamblit has two TriStation pods on Planet Hollywood’s casino floor alongside three of the Model Gs. They’re located on the south side of the property, just outside P.F. Chang’s, not far from the casino’s Strip entrance and across the casino from the theater where Britney Spears performs her Las Vegas residency. The minimum coin-in and maximum jackpot are different in each game and can vary in each casino. However, the minimum bet ranges from 50 credits (50 cents) in most of the TriStation games or $1-$2 minimum bet on the “Into the Dead” game. The maximum bet in many of the games is often $10. The maximum win also varies game to game and, because they’re interactive, with the players’ skills. Top-end payouts on some games range from 100-1 to 300-1 on the max bet. On the “Into the Dead” game, the maximum win is 8-1 if, for example, the top bet is $5. Because the games are so new and also because gaming manufacturers and casino companies almost never reveal specific revenue numbers, it’s difficult to know how the games are performing. The fact that none of the earlier Model G’s have been pulled from casino floors anywhere in Las Vegas is proof they are doing well, Gamblit’s chief of marketing Darion Lowenstein said. “If they weren’t making money, they wouldn’t give us the floor space,” Lowenstein said. Aside from the obvious interactive aspect, Gamblit’s games are also different in the way they’re branded. The company mascot, a red letter “G” stylized to look like a face, sits atop each TriStation, to create more brand recognition than is typical of most games. However, Lowenstein said Gamblit isn’t just counting on the mascot to attract players. It’s also working with Caesars to promote the new games. A Gamblit-produced video trailer for the game plays on screens throughout Planet Hollywood. The game is included in loyalty card promotions and on flyers given to hotel guests. Gamblit isn’t the only company producing interactive games. Konami has introduced a version of “Frogger,” undergoing the New Innovation Beta process at the Level Up gaming lounge at the MGM Grand. GameCo. has also introduced interactive games in Atlantic City. And years ago, some early attempts at interactive games were introduced as bonus rounds on traditional slot machines.